Acrylic Cable box and Plasma, HDTV, and Monitor stand riser. 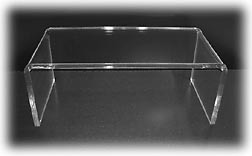 Our Clear Acrylic Plasma, HDTV, TV, and computer monitor risers and stands are produced from 3/8" and 1/2" thick clear acrylic material. The 3/8" thick stands are formed from one piece of acrylic which will have 2 small rounded edges, one on the left side and one on the right side. The 1/2" thick stands are made from 3 separate pieces of acrylic with the top piece haveing all 4 top edges beveled with 2 side pieces bonded for extra support for heavier units. All edges are polished.